Vanilla Fudge are awesome. They do heaps of sweet psychedelic covers of famous songs. Need I say more? They are also named after a delicious food, which I have quite literally tried to recreate here. I haven’t used cacao butter too much in the past – in fact I’ve only ever used it to make raw chocolate – so I was unsure of how this might turn out. I had hoped that it would help the fudge to be a bit more solid and hold form, which it did. Funnily enough, it turned out tasting very white chocolatey, maybe more so than fudgey. Regardless, I reckon it tastes pretty damn good. I cut it into bit sized squares with the intention that one as a little afternoon treat would be adequate. Obviously I ate it all within a few sittings. Ahem. Prepare a slice tin by lining with baking paper. Blend cashews until they resemble coarse crumbs. Melt coconut oil and cacao butter over double boiler, then add to blender along with agave, maca, vanillas and salt. Blend until combined. Add coconut cream and blend until smooth and creamy. Pour into prepared tin and place in the freezer until set. For the topping, melt coconut oil over a double boiler. Remove from heat and whisk in remaining ingredients. Pour over fudge base and return to the freezer until set. Store in the fridge to avoid meltiness. I totally dig this cover of the Zombies song, She’s Not There. Ch-ch-check it out! The last chorus just kills it! Yeeeeow! I was saddened by the speed at which we lost this poor fudge…he never had a chance! I know, right? I’ve been trying to savour it since I bought it…I’m always worried that I will muck something up and waste the precious cacao butter! My goodness, that fudge is one of the tastiest looking things I’ve seen recently! I’m of the opinion that tasting of white chocolate can only be a great thing! 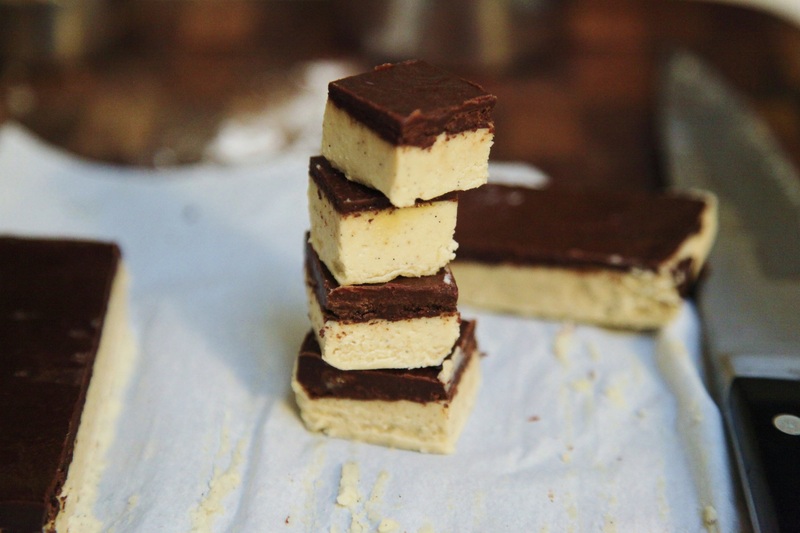 I always wanted to make vanilla fudge and your raw version looks so gorgeous! Thanks Mihl! I’d love to see what you come up with if you give it a go 🙂 Vanilla is just so tasty. How could it be anything but spectacular with those ingredients! I’ve never even seen cacao butter in the shops. I must have a look around next time. Thanks Linda! I’ve definitely noticed it around more in the last year or so – a lot of health food shops stock it now. Loving Earth sell it, and there’s another one I see around a bit too in a square container – I think it’s called power foods or something? I’ve seen it used in body products too, so I want to have a go using it for some kind of body butter or lip balm or something! Ooohh that looks so tasty! I tried to make fudge for this mofo and failed, so will definitely try this once September is over. Glad yours was a success! Wow, what a clever idea! They look lovely. these look so good!! 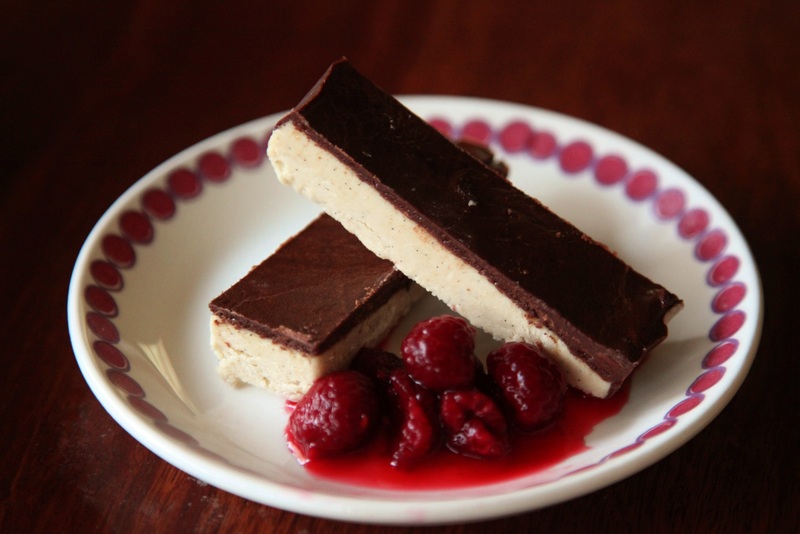 thanks for sharing, i haven’t had fudge in ages so this recipe is a great inspiration.